Here I am in Florida. It’s where my BFF lives–in a sprawling house on a golf course with a pool. I have a room (at least, I have proclaimed it mine! I just need a flag, according to Eddie Izzard) with a door that opens directly across from the hot tub. It’s a rough life when I’m in Florida. I try to do something here that I’m not good doing elsewhere (except Momma’s where there’s no internet and sketchy phone service) and that’s disconnect. Bad for readership. Good for sanity. Not to worry, I have been collecting stories to share–so be prepared for the deluge of those in the upcoming days…just getting it in sharing form is the complete antithesis of my Floridication. While in Florida, I like to eat as much seafood as possible and as I’m picking apart my crab legs the other day, a thought struck me: who was the first person to look at a crab with all it’s tiny legs and big claws and hard shell and beady eyes and think “oooohhh, I bet that’s tasty!”? And then, to pick it apart–piece by piece. Btw, if you eat way too fast try crab legs–nothing makes that process faster…unless you can convince family, friends, and random strangers three tables over to help you! A quick internet search suggests eating crabs have been around since prehistoric times. Makes sense for hunter & gathers near the sea. The Chinese have a legend about the first person to eat a crab. It offers a bit of insight, but I still wonder what was going through the minds of the people as they are chasing down these strange looking creatures. Sure, once someone had a bite of the delicacy, they were more prone to chase the suckers down the beach. But just doing it on blind faith? Nothing short of amazing! And speaking of ahhhh-mazing: THANK YOU! to whomever decided it would be a great idea to dip it into butter. m’wah! m’wah! m’wah! What? Butter makes everything better. You know, just like bacon. The downside? The Sea Salt Eatery is only open April through October. Actually, it’s probably a good thing. Winter is NOT the time to be sitting outside in Minnesota! But trust me, Sea Salt is a great destination stop while in the Twin Cities. Go, enjoy the sun, the scenery, get a local beer, order fresh seafood, kick back and relax…and that’s an order! 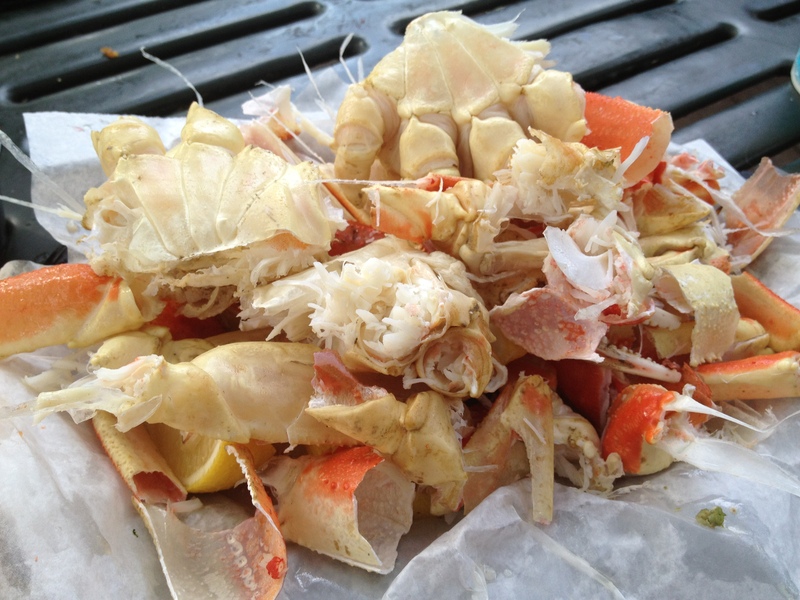 If you’re not fortunate enough to get to Sea Salt this summer, there’s still a lot of great crab legs out there. Go out and enjoy the sweet, buttery deliciousness; just pay homage to whomever was crazy enough to brave snapping claws and figuring out how the victor worked his/her way through danger and the shell to the delicious spoils. Happy Fourth of July! Independence Day…or as the British like to call it, The Colonies are Acting Out, But I’m Sure They’ll Straighten Out Soon….Orrrrr Not. The birth of a nation and we celebrate with activities ranging from baseball games to cookouts to water activities to blockbuster movies to fireworks displays all throughout the country. And, if you are most anyone I know, beer. Lots and lots of beer. Or at least a couple. Or one. ONE BEER. For those of you who know me, you know that when it comes to beer, I will drink Texas, Irish, and ANYTHING from Belgium. Occasionally when feeling adventurous (or none of the above is included in Happy Hour), I will branch out to include other beers…and The Fourth of July is one of those times. I feel that, in honor of our forefathers, one should imbibe in American beer (and yes, I acknowledge that technically Texas beer is American beer, but until recently nearly non-existent in NYC). Enter Blue Moon. Colorado beer made by an American, who learned beer mastery in, well, Belgium. That’s because Belgium makes great beer. Period. End of Discussion. Don’t argue, it will fall on deaf ears. 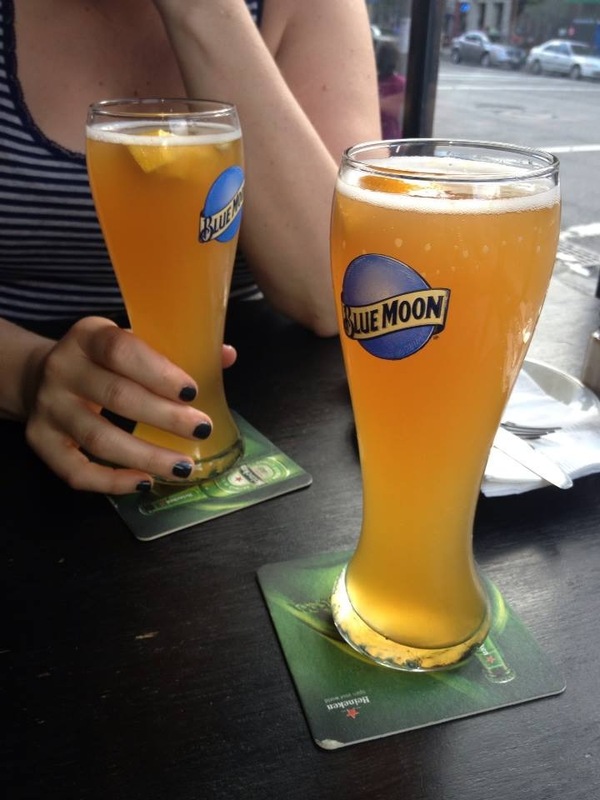 Blue Moon is a great summer beer. It’s light, it’s refreshing, and when it’s served with an orange slice on a hot day, magical. Especially when you’re at a bar, eating chicken nachos. Or at a picnic in the park. Or a backyard BBQ. Or a pool party. Or…well, you get the idea. Blue Moon now has several varieties, none of which I have tried other than the original: The Belgium White. And like all traditional hefeweizens, it’s served with citrus. However, unlike most hefes, it’s best with an orange (usually hefes are served with lemon wedges), something that initially I thought I’d hate–but in fact, have grown to love and crave, particularly in the hot, sweltering summer when even Stella seems too heavy! Just a side note, like all beers, it tastes COMPLETELY different when you drink it from the bottle and the orange slice is ESSENTIAL for making it pop. So, if you’re at home–do yourself a huge favor and drink it out of a glass and make you add an orange slice!